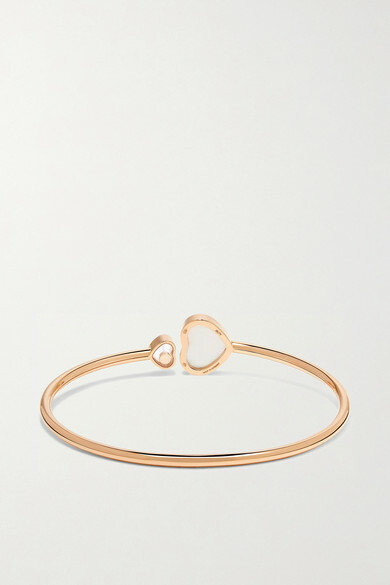 Chopard's 18-karat rose gold cuff is part of the 'Happy Diamonds' collection, a signature of the house since the '70s. 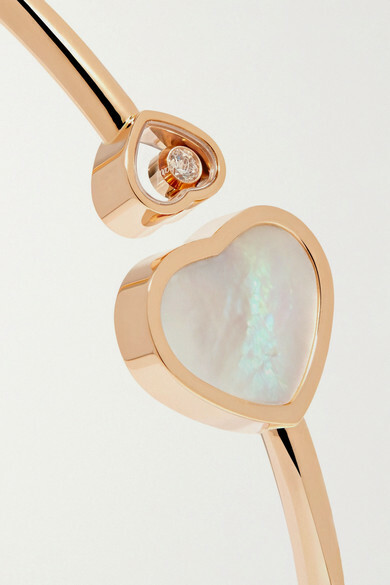 This elegant piece is finished with two heart charms at either end – one is inlaid with lustrous mother-of-pearl and the other features a 0.05-carat diamond that floats freely within a sapphire crystal glass casing. It's beautifully presented in a leather box that makes it perfect for gifting to someone special. Shown here with: Goldsign Jeans, The Range Bodysuit, Nili Lotan Cardigan, Chloé Shoulder bag, Chopard Necklace, Chopard Ring.